JeffGambler: Do You Want to Win in Blackjack? Do You Want to Win in Blackjack? Did you know you can win whenever you play blackjack? You simply need to know how. Well, guess what? 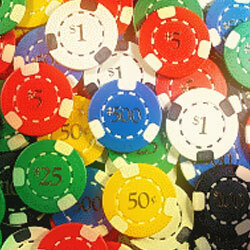 You can find out how with the rules of blackjack or chart here. With today's advancements in computer technology, you can now play tons of blackjack hands in just a short period of time to simulate any great blackjack strategy on any situation possible. Do You Know What a Blackjack Chart Is? A blackjack chart can let you know exactly what you have to do as you play the game. Take a look at the chart and match whatever hand you currently hold with it; it's that simple. If you choose to follow a blackjack chart on a consistent basis, there are high chances that you won't lose any more than 0.5 pct on average from your bets, which is much better compared to other games in casinos. Plus, your loss on average would be much higher in games such as slot machines or roulette anyway. Still, this only focuses on average numbers, though; naturally, you could still get lucky and actually win tons of money between periods. It would be recommended for you to use a blackjack chart as often as possible, unless you memorize them or become an expert at counting cards.